Here's mud in your eye. And your hair, back and legs. It was a mother's nightmare and a kid's fantasy come true. 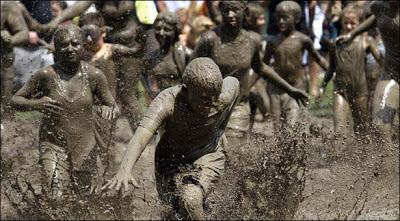 Hundreds of children on Tuesday jumped into a 75-by-150-foot mud pit as part of the 26th annual Mud Day at a park in the Detroit suburb of Westland. Events included wheelbarrow races and a game of limbo. A panel of judges selected a king and queen, based on their creative uses of mud. Emily Cunningham of Riverview was chosen Queen of Mud. A crown was placed atop the 8-year-old's head, which was caked in mud and adorned with leaves and a stick. She says, "It's fun getting mud all over you."